While leopard print is a perennial style staple, there’s a new contender for the animal print crown. Snakeskin is proving to be one of the most popular microtrends of fall 2018, and beyond. Here are some ideas on how to wear snake print – including some fabulous snakeskin booties. Snake print was a big feature of the Fall 2018 runways. The likes of Chloe, Gucci and Proenza Schouler all featured snakeskin. 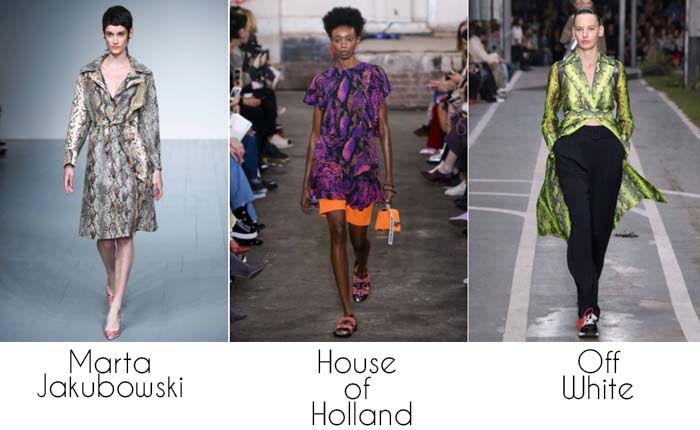 But, showing that this is a trend that definitely has longevity, snake print has also been a big fixure on the spring and summer fashion shows for 2019 (above). Up-and-coming designer Marta Jakubowski featured a hero-piece trench, which would look fabulous over a neutral outfit. Meanwhile, British designer Henry Holland also went heavy on the snake print, pairing it with beautiful blues and purples. 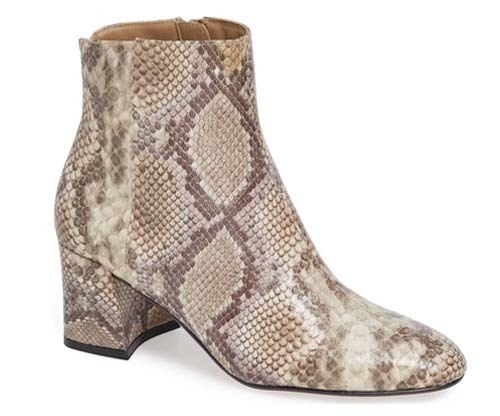 Thankfully, the high street has picked up on the trend and has lots of beautiful pieces already in stores for fall, including my favorite take on the trend – snake print booties. Opt for snakeskin accessories. 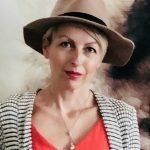 If you don’t want a full-on snake print look, then just adding a bag, bangle, scarf or pair of shoes in snakeskin can make a huge difference to a neutral outfit. 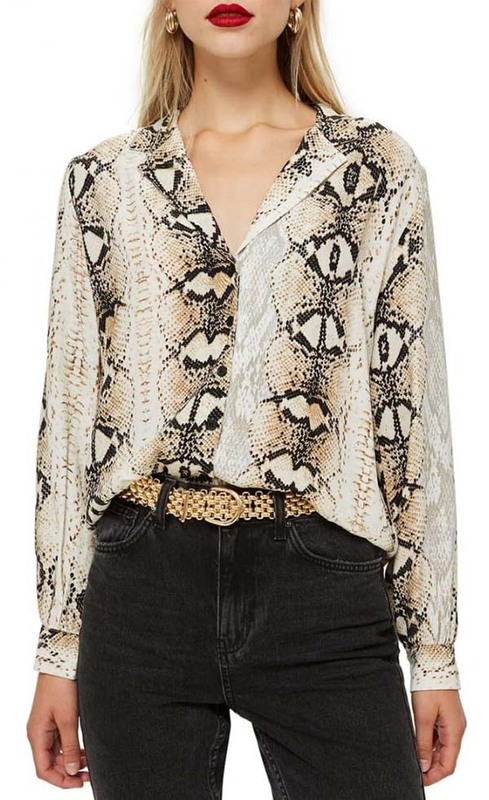 Pair a snakeskin blouse with your denim. A chic everyday look would be to wear a print shirt with your jeans. Opt for a snakeskin dress or jumpsuit, and wear a blazer with it or a leather biker jacket. Go full on. If you really want to make an impact, you could go with a snakeskin coat, but keep the rest of your outfit neutral. Wear snake print in the same way you would usually wear your leopard print. Here are 10 of the best snakeskin pieces available now. Let me know what you think of the trend in the comments below. A snakeprint shirt is a great alternative to a leopard print piece. 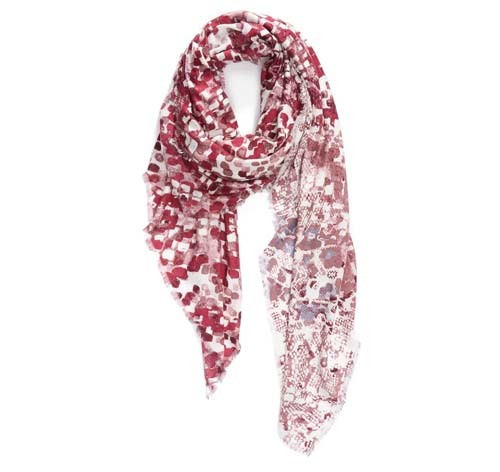 This one is from Topshop and is very versatile for either work, or for casual wear with jeans. 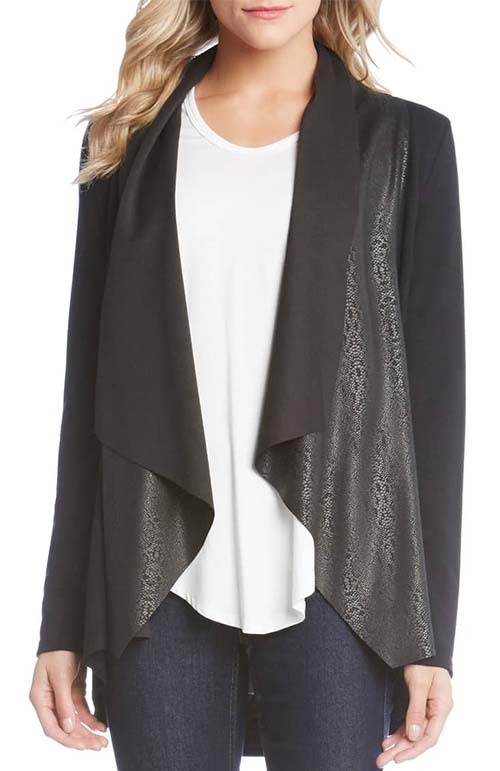 This draped waterfall jacket by Karen Kane is a really subtle take on the leopard print trend. The embossed snake print texture adds extra interest to a look. You could simply wear with blue jeans and a white tee. 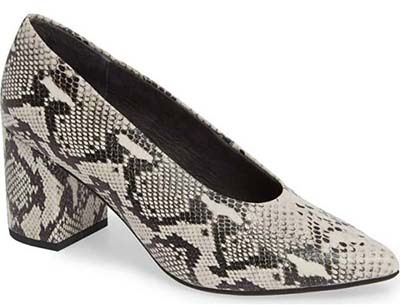 A great way to update a classic court shoe, this snakeskin pair by Seychelles has a chunky heel, making them much easier to walk in than some styles. Style and comfort, what more could you need? This has got to be my favorite take on the trend for fall and winter. These snake print boots would be an easy way to update an otherwise simple outfit. Mango has some great snake print options in store at the moment. I love this co-ord set as you could wear both together as a dress or split up the shirt and skirt to create more outfit options. I’d wear the shirt with jeans or a leather skirt, and the skirt with a chunky knit and knee-high boots for fall. This double buckle leopard print belt by Love Strength can be worn over dresses, tops, cardigans and jackets to update your look. Waist-clinching belts were one of the major accessories trends for fall 2018. You don’t have to have a lot of snake print in your outfit for it to make a real impact. 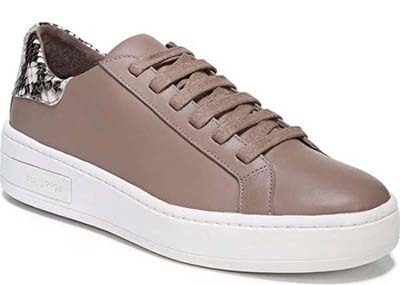 I love the snakeskin detailing on these sneakers by Via Spiga. 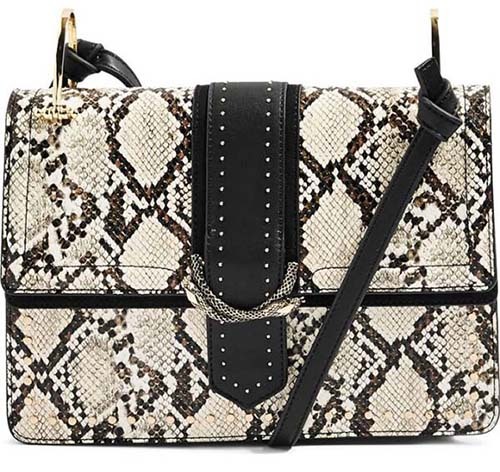 Many designers opted to create snakeskin bags this season. This is an interpretation of the look from the high street, and is one of a number of snake print handbags from Topshop. 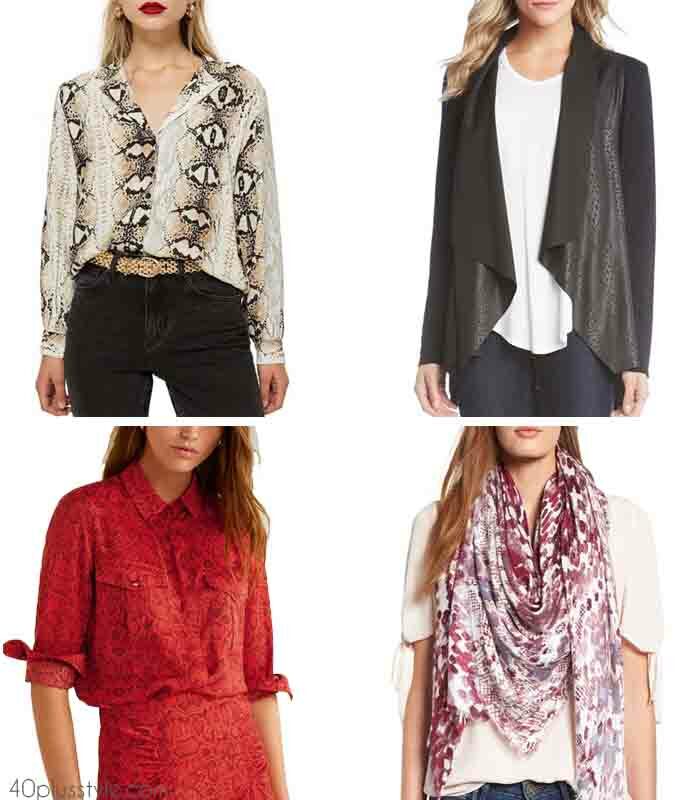 A scarf is always a quick and easy way to update an outfit, and can tie everything together. This purple snakeskin scarf features very subtle pieces of snake print as well as geometric patterns and could easily be slung on over a neutral blouse, with jeans and burgundy booties. 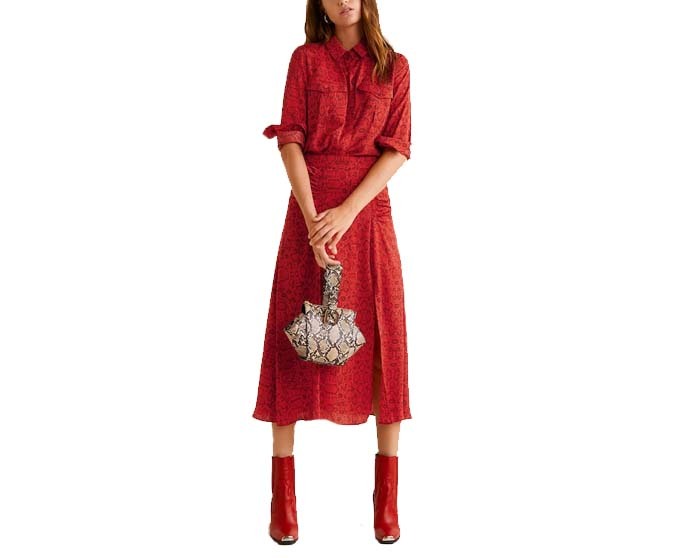 Because animal print, and snake print, is pretty much always on trend, it’s also worth searching thrift stores for snakeskin pieces as you’re likely to find clothes and accessories from previous seasons. I also noticed some great designer snake-print pieces at The RealReal. Is snake print the new leopard print? Well, leopard print will definitely always have a place in my closet. But, I can definitely find room for some snake print too! Will you be adding some snake print to your own closet? 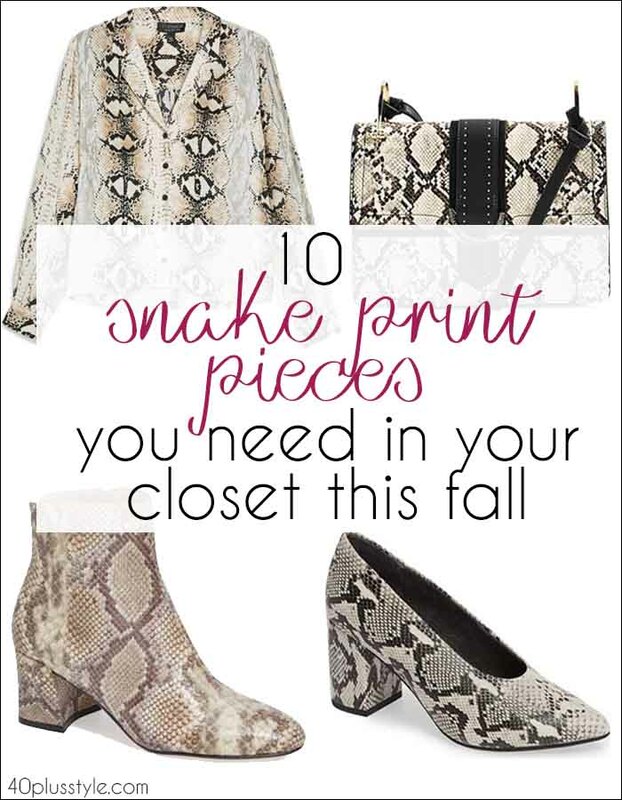 Or do you already own snakeskin pieces? Fabulous print! I love it! Nice, very nice. I am a very lucky girl.I already have python print pumps.